Like most major cities New York boasts a great bike sharing program called Citi bike, that acts as the perfect alternative to public transit. The idea behind bike sharing programs such as Citi bike, are to give locals and tourists an easy, cost effective way to navigate around the city without worrying about schedules or transfer points. Citi bikes are pretty easy to spot, you'll notice rows of bright blue bikes conveniently located all over the city, each attached to an electronic docking station that secures the bikes until you're ready to use them. This is how Citi bike works: First you choose your pricing plan from three different options; Annual membership which is $95 USD, 7-Day access which is $25 USD, and 24 access is $9.95 USD. Those fees will secure your ability to use the bikes for the time period you choose. Once you've paid your fee you'll get a 'ride code', which you'll need to enter into the electronic dock in order to unlock your bike. As soon as you release the bike from the dock your time starts, and you're charged $4 USD for each hour you use the bike. However, if your Citi bike trip is less than 30 minutes (meaning you return the bike to any dock location) it's free! Smart New Yorkers use their Citi bikes to get from one place to another in under 30 minutes, dock their bike, and take out a new bike when they are ready to travel again. That way they're only paying the original access fee and avoiding the $4 per hour charge. The best way to do this would be to plan out your day with each stop you need to make, then located the nearest corresponding Citi bike docking stations to your destinations. There are over 300 docking station in the city and usually they're located conveniently near attractions or shopping destinations. If your Citi bike trip is less than 30 minutes it's free! When you return your Citi bike to a dock make sure you see the green indicator light that lets you know your bike has been locked up properly. If you get to a docking station and it's full, head over to the kiosk screen and navigate to "time credit" which will give you an extra 15 minutes to find another docking station without charging you any additional fees. 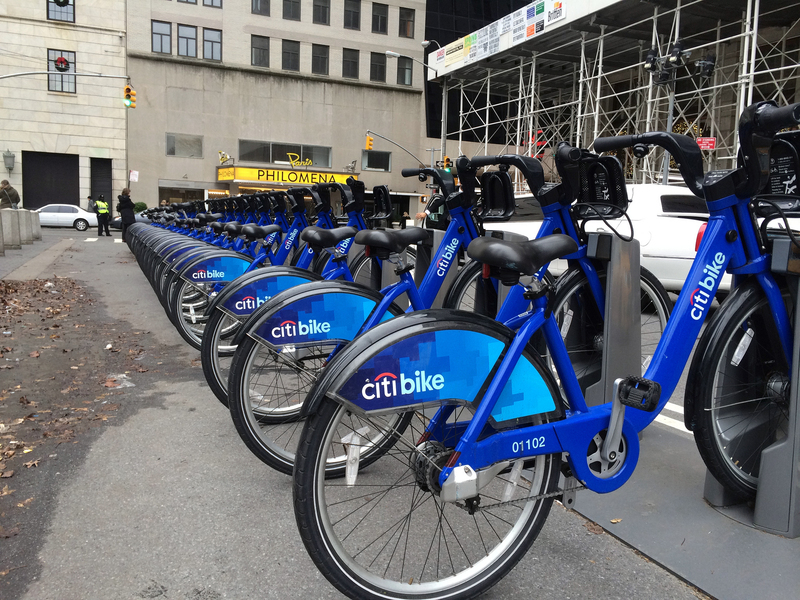 Citi bikes are available 24 hours a day 7 days a week, so you can use them at any point during your visit. Be warned though, New Yorkers use Citi bike as a mode of transportation to quickly get from point a to point b, not to take a leisurely ride through Central Park. We've heard a few New Yorkers complain there are never enough bikes when they need them, and that tourists tend to lock up Citi bikes in front of stores and restaurants, keeping them for much longer than necessary. If you're looking for a leisurely ride there are plenty of other bike rental shops that can provide a more cost effective service. Think of Citi bikes like a taxi—get in and get out as quickly as possible so the next person can use it.